North of Cape Hatteras, rode waves at Kill Devil Hills (where Wright Brothers flew first flights) and visited one of four unique Brew Thru drive-through beverage stores (though selection was limited), August ‘04. At nearby OUTER BANKS BREWING STATION (open since 2001), originally quaffed sugar malt-spiced, green apple-soured Altimeter, tangy citric-sweet coriander-spiced wheat-chaffed Belgian-styled Wright Wit, soft curacoa orange-embittered ESB, dry chocolate-chalked Irish-styled Stormy Roses Stout, and dryer coffee bean-roasted, hickory-charred, maple-malted Smoke Daddy Porter. Over the course of a decade, this modern interpretation of a life saving station grew in size and stature, becoming the first turbine-infused wind powered brewpub in the nation. Keeping its vintage unfinished barnstable appeal, the large pub then added a spacious umbrella-lined back deck (with kids pirate ship playground, picnic seating and trellis) while offering a wider array of beer styles. 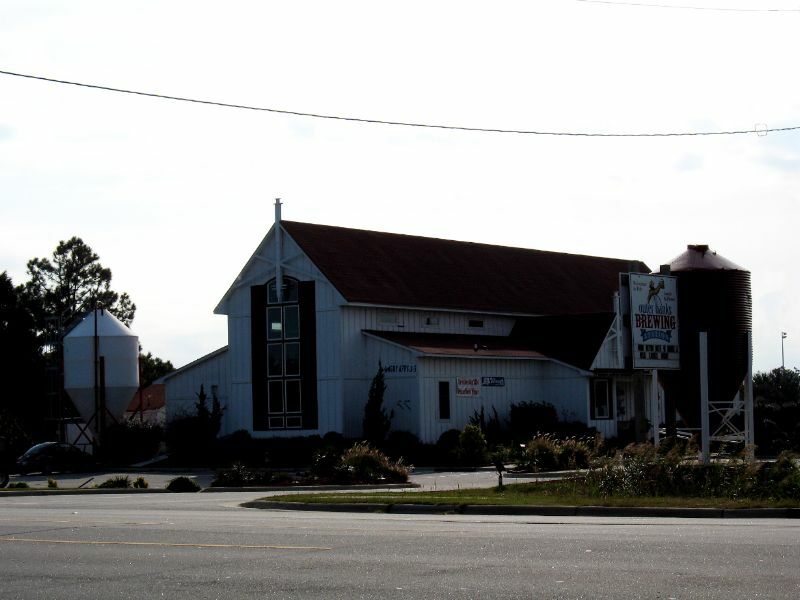 A pleasurable experience for all ages, Outer Banks Brewing Station really packed ‘em in on my Sunday evening dinnertime stopover, August ’15. The creative pub fare may not be ‘revolutionary cuisine,’ but it’s damn fine. A centralized bar with open kitchen serves homemade tapped beer and fine wines alongside surf, turf, ’pubwiches’ and appetizers. The airplane hangar-like tin ceiling provides protection for the rustic wood furnishings, diner-styled red booths, private loft, glass-encased brewtanks, exposed ducts and beach-bricked tracks. Earth-toned silk screen murals line the walls and a widescreen TV at the bar keeps sports-minded patrons entertained. My wife and I grab a seat at the elevated front section (used for late-night band performances) to share a beer-marinated flank steak sandwich (with sauteed onions, peppers and melted cheese), crab bisque and fried flounder. For soft-toned aperitifs, the increasingly popular Lemongrass Wheat Ale (available in cans) brought tangy lemon zest, ginger-spiced cologne perfuming and floral accents to stylishly neutralized banana-clove sweetness while Weihenstephaner yeast gave Hugh Hefeweizen its distinct white-peppered banana, clove, coriander and bubblegum sugaring. Briny lemon-perfumed mandarin orange tartness and light yellow grape esters regaled light-bodied Olsch Kolsch. French saison yeast and dry Saaz-hopped white peppering enlivened It’s My Birthday Saison, an herbaceous moderation with honeyed orange sweetness and spritzy lemon tingle. ‘Poundable’ Late Game ESB brought mild Fuggle-hopped astringency to tea-like earthen dewiness and subtle dried fruiting. Sessionable, despite its sharp hop influence, Dr. Rudi IPA provided woody-perfumed grapefruit and orange rind bittering to distant honeyed malting. As a delightful digestif, malt-smoked Broke Tooth Stout layered barley-roasted black chocolate atop dry cocoa and spiced dried cherry. During June ’16 trip, chomped on tilefish while discovering four previously untried brews. First up, mild Bohemian-styled Love Pils, saddled easygoing wood-dried Saaz hop bittering with lightly spiced lemon-peeled seltzer spritz. Sessionable ESB, Alliance Ale, placed sweet toffee and crystal malt spicing against dry peat malts, picking up a mild mint stint. Commendable 15th anniversary celebrator, Belgian IPA, sprinkled salty white pepper spicing atop zesty lemon, mandarin orange, clementine and tangerine tang as well as buttery Chardonnay nuances and herbal notions. After dinner, dark-roasted cocoa malts, peanut-shelled walnut char and dry spicing anchored Custom Brown Ale. 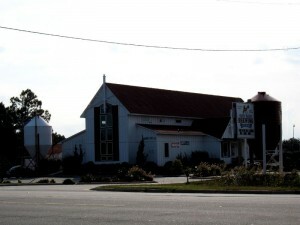 Also worth exploring in the Outer Banks were Chip’s Wine & Beer Market (500-plus beers and elegant tasting room), Yellow Submarine (great sandwiches, pizza and tapped beer) and Lucky 12 sportsbar (20 tapped draughts, 50-plus bottled beers, nostalgic diner-styled seating and glass-encased beer can collection).